Loudoun Tech: Leveraging Blockchain For Your Business (via Marty Shoup, Blue Lion Multimedia). FOMO: Fear of Missing Out. It’s the anxiety that comes from suspecting that something great is happening somewhere, and you’re not a part of it. Most FOMO is needless, but when it comes to the Loudoun Technology Coalition, it’s justified. If you are working on a solution that is enabled by technology, don’t miss the next opportunity to connect with industry peers in the Technology Coalition. The Loudoun Chamber of Commerce’s Tech Coalition meets the 3rd Friday of each month at 9 a.m. at the chamber office in Lansdowne. In addition to the monthly meetings, the Loudoun Tech Coalition leverages the power of the chamber to host targeted events. These events not only allow technologists to interact but also gives general business executives the chance to learn how emerging technologies may impact their companies. 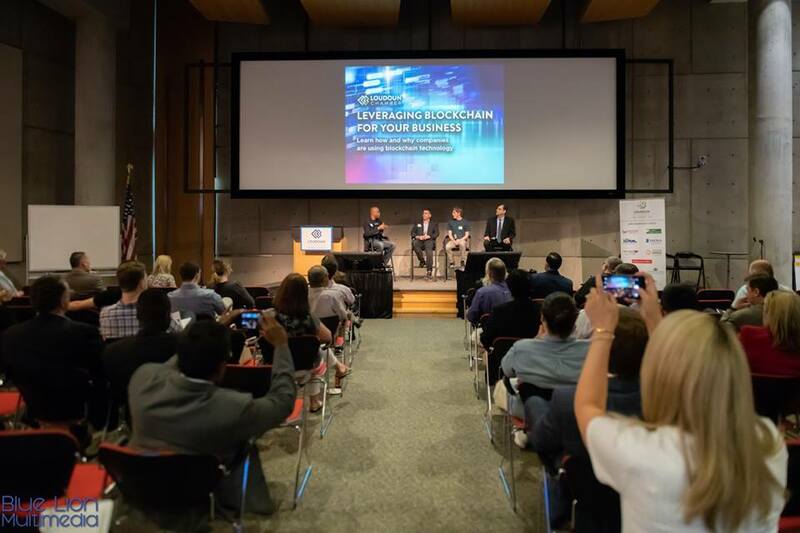 For example, this spring the coalition held Loudoun’s first-ever public-facing event about Blockchain technology, “Leveraging Blockchain for Your Business.” Jason Sfaelos with Equinix was featured as part of the panel discussion. The Tech Coalition is led by two new tech-passionate professionals: Loudoun Economic Development’s Entrepreneurship Manager Vanessa Wagner (that’s me! ), and CryptoWatch360 Co-Founder Paul McNeal. As a startup evangelist, I want to use the coalition to raise awareness for Loudoun’s technology companies and the problems that they are solving. The monthly meetings begin with a 10-minute showcase from a local firm followed by a Q&A and feedback from the attendees. I see the showcase as both a technical discussion and a business development opportunity. The group definitely geeks out about the tech, but more importantly, the Tech Coalition provides a platform to share the type of support that a company is seeking with a like-minded group of professionals. If you want to end FOMO about the Tech Coalition, get on the list of upcoming meetings and events by emailing me at vanessa.wagner@loudoun.gov.